Sunshine and blue sky as we started what our B&B host said would be a long hard day. It didn't look all that bad to me! A very pleasant morning with a few good hills but nothing worse than the downhill section in Hailes Wood. We did not visit Hails Abbey as we were there a few years ago and were having lunch at the Lion Inn in Winchcombe by 1pm (early UK lunch). The afternoon was uneventful as we passed Sudeley Castle, Belas Kanap Long Barrow and Postlip Hall and approached Cleeve Hill Common, one of the largest at 1,120 acres at around 4pm. The Cotswold Way basically goes around the outside of the common and the further we went the stepper, colder and windier it got. By the time we Upper Hill Farm it was close to 6 and we were done. The last host was correct. This part of the walk was supposed to be one of the highlights of the walk but not that day for us. After a rest our host drove us down to the Hewlett Arms for supper. We felt a little better as we met three young (mid to late 20's) who were complaining that Cleeve Hill went on forever and they though it would never end. Stanway Cricket Pavilion - 1925 by John Oakey of Winchcombe presented to the cricket club by Sir James Barrie. Timber framed, clad with larch poles, thatched roof. Building is raised on 5x5 staddle stones, front has full width covered verandah, behind which are 4 shuttered openings and central doorway; back has recesses to left and right covered by continuous roof, that to left part enclosed by larch poles, that to right with steps to a door. Each recess contains a casement window, and there are three small square casements set high in the centre section. Interior not inspected, but said to be fitted in Columbian pine. Sir James Barrie was a frequent visitor to the Earl and Countess of Wemyss at Stanway House (q.v.). The pavilion appears to be externally unchanged. Cromwell's Seat - located near Beckbury Camp, a late bronze age hill fort. Supposedly this is the spot that Thomas Cromwell watched from as Hailes Abbey was burnt. There are markers or descriptions we could see so only learned what we say later on the internet. Hailes Abbey Ruins - We had visited here several years ago but it was the year after our tour fo the Scotish border country and these ruins pail compared to Melrose, Kelso, Jedburgh & Dryburgh. You can see much of the original building materials repurposed for nearby homes. , The abbey was founded in 1246 by Richard, Earl of Cornwall, called "King of the Romans" and the younger brother of King Henry III of England. Richard founded the abbey to thank God after he had survived a shipwreck. Hailes Abbey became a site of pilgrimage after Richard's son Edmund donated to the Cistercian community a phial of the Holy Blood, purchased in Germany, in 1270. Such a relic of the Crucifixion was a considerable magnet for pilgrimage. From the proceeds, the monks of Hailes were able to rebuild the Abbey on a magnificent scale. Though King Henry VIII's commissioners declared the famous relic to be nothing but the blood of a duck, regularly renewed, and though the Abbot Stephen Sagar admitted that the Holy Blood was a fake in hope of saving the Abbey, Hailes Abbey was one of the last religious institutions to acquiesce following the Dissolution Act of 1536. The Abbot and his monks finally surrendered their abbey to Henry's commissioners on Christmas Eve 1539. Sudeley Castle - located in the Cotswolds near Winchcombe, Gloucestershire, England. This was our second or third visit to Winchcombe and once again we did not visit Sudeley Castle. I guess were are just saving that one. The present structure was built in the 15th century and may have been on the site of a 12th-century castle. The castle has a notable garden, which is designed and maintained to a very high standard. The chapel, St. Mary's Sudeley, is the burial place of Queen Catherine Parr (1512–1548), the sixth wife of King Henry VIII, and contains her marble tomb. Unusually for a castle chapel, St Mary's of Sudeley is part of the local parish of the Church of England. Sudeley is also one of the few castles left in England that is still a residence. Cleeve Hill Common - is a 455-hectare biological and geological Site of Special Scientific Interest in Gloucestershire, notified in 1974. It is looked after by a small charity called Cleeve Common Board of Conservators. 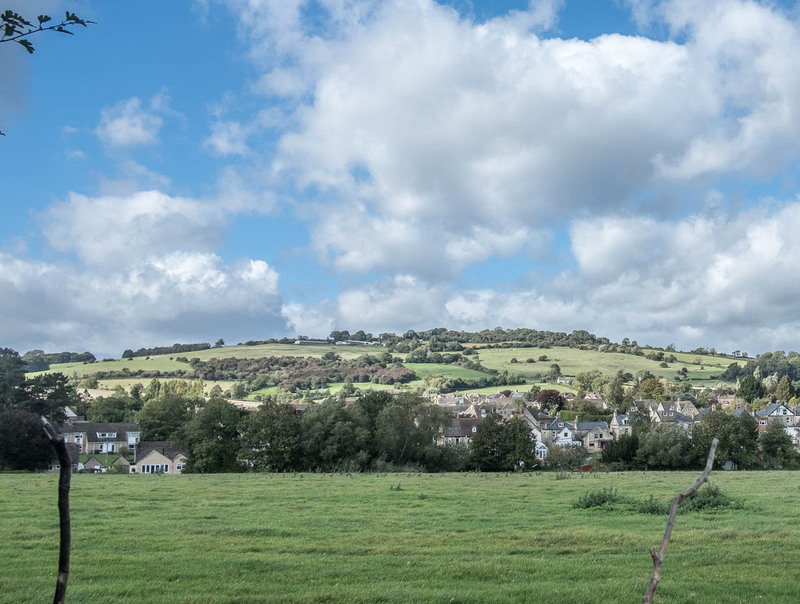 It lies in the Cotswold Area of Outstanding Natural Beauty and is on Cleeve Hill. I think we need to revisit this on a fine summer day! Upper Hill Farm - Set high in the Cotswolds on the edge of Cleeve Common, Upper Hill Farm offers tranquil, quality bed & breakfast accommodation for both the leisure and the business guest. Beechfield House is a Cotswold Stone Country Farmhouse C18th with many original features including flagstone flooring, wooden beams and exposed stone walls.